Los Angeles Car Accident Lawyer | How Much is Your Case Worth? In the United States, the automobile is a way of life – especially in Los Angeles, California. Most of us drive or ride in a car, bus, truck, or other motor vehicles every day. However, because of how ubiquitous cars are to our lives, we often forget just how dangerous they can be and how often serious car crashes occur. According to the National Highway Traffic Safety Administration, automobile accidents are the cause of one death every 12 to 15 minutes and injure more than 2.5 million people each year. Our Los Angeles personal injury lawyers have seen firsthand, that nearly half of those injured come away with permanent disabilities like brain damage, paralysis, amputation injuries, orthopedic injuries and other serious ailments that significantly and negatively affect the lives of crash victims. In cases where a death results, the family members of those killed suffer both emotionally and, often, financially. If you or a loved one were seriously injured in a motor vehicle accident in the Los Angeles area, our attorneys can help. At Panish Shea & Boyle, our Los Angeles car accident attorneys have significant experience handling all manner of motor vehicle collision cases. We have secured over one billion dollars for our clients in the past 10 years. We have the skills, experience and resources needed to take cases where they need to go. We have a proven track record of winning cases against large insurance companies, government entities and even automobile and parts manufacturers. We handle all cases on a contingency fee basis, meaning we charge absolutely no fees unless we win. We advance all costs associated with the cases we handle. We offer a free and confidential case evaluation. Why Should I Hire a Los Angeles Car Accident Attorney? If you’ve lost a loved one or sustained a very serious injury in a car accident because of another driver’s carelessness, you have the right to hold that driver responsible for his or her actions. A Los Angeles car accident lawyer can’t make things the way they were before the crash, but we can help compensate you for the terrible, unexpected losses the crash caused. A motor vehicle accident lawsuit can also help pay high medical bills and other costs caused by the accident, and provide financial support for those who’ve lost an income to an injury or an unexpected death. And in some cases, it can help you prevent a similar tragedy from happening to others. A lawsuit is often the only way to hold wrongdoers and companies accountable for actions that put consumers at risk. Panish Shea & Boyle has a demonstrated history of success in auto and tire defect cases, including a $4.9 billion verdict against General Motors (GM). We have multiple locations across Southern California, so if you are local to the Inland Empire and require a Riverside car accident lawyer or San Bernardino car accident lawyer for example, we are always available to you and know the areas well. How do LA Freeways and Roadways Factor into Vehicle Collisions? How many Alcohol Related Vehicle Fatalities Happen in Los Angeles? 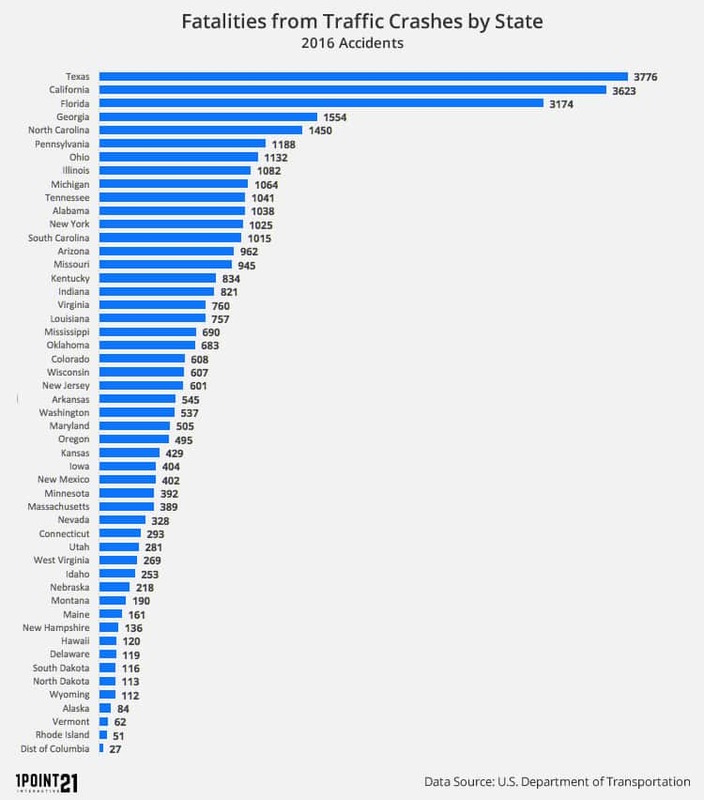 How Does California Compare to the Rest of the Nation with Motor Vehicle Fatalities? What Can I Do To Reduce My Risk of an Auto Accident? What are some Examples of Motor Vehicle Accident Cases that Panish Shea & Boyle, LLP have handled? As the population grows in Los Angeles each year, so does the total number of car accidents. Extrapolated from data collected from the California Highway Patrol, you can see a breakdown below of the total number of reported car accidents, injuries from these accidents, and the total fatality counts from 2010 to 2015. From 2010 to 2015, there has been an increase of 1,275 in total total reported collisions which is an increase of 6.02%. For fatalities there has been an increase of 15 reported fatalities, which is an increase of 28.84%! How do Los Angeles County Freeways and Roadways Factor into Accidents? There many contributing factors to the large number of car and motor vehicle accidents that occur in Los Angeles. However, none are bigger than the sheer amount of motorists on the thousands of miles of roadways and highways. According to the California Department of Transportation, there are over 20,771 miles of total roadways, 527 miles of freeway and 382 miles of conventional highway in Los Angeles County. In addition, there are over 5.8 million registered cars and well over 7.5 million total motor vehicles in Los Angeles county. Incredibly, only 5 STATES have more registered vehicles than Los Angeles County and this figure is only going up as 600,000 cars are sold in L.A. every year. On the average day, motorists in Los Angeles county drive over 92 million vehicle miles. Car accidents happen all over Los Angeles, as many people have to spend a lot of time in their cars in traffic, as well as travel lengthy distances to commute to-and from work. There are particular areas in Los Angeles where we find higher occurrences of car accident fataliteis. From our recent study, here are the Top 5 Most Dangerous Intersections for Auto Collisions in Los Angeles county. There are other important statistics around the fatality rates from car accidents in Los Angeles. From California’s Statewide Integrated Traffic Records System (SWITRs), here some other staggering realities. How Many Alcohol-Related Car Accident Fatalities Happen in Los Angeles? How does California match up to the rest of the nation with motor vehicle fatalities? According to the statistics from the U.S. Department of Labor, California is ranked #2 in the total number of vehicle collision deaths in 2016. During that year, there were 3,623 fatalities. In California alone, thousands of people are killed each year in car accidents and hundreds of thousands more are injured. Take a look at the number of injuries and fatalities in California car accidents from 2005 – 2012. Nearly 1.3 million people die in road crashes each year, on average 3,287 deaths a day. An additional 20-50 million are injured or permanently disabled. More than half of all road traffic deaths occur among young adults ages 15-44. Motor vehicle accidents are the 9th leading cause of death and account for 2.2% of all deaths globally. Auto accidents are the leading cause of death among young people ages 15-29, and the second leading cause of death worldwide among young people ages 5-14. Nearly 400,000 people under 25 worldwide die in auto accidents annually..
Over 90% of all road fatalities occur in low and middle-income countries, which have less than half of the world’s vehicles. Road crashes cost (U.S. dollars) $518 billion globally, costing individual countries from 1-2% of their annual GDP. Auto accidents cost low and middle-income countries $65 billion annually, exceeding the total amount received in developmental assistance. While you can never completely avoid the risk of a car accident altogether, you can significantly reduce the chance that you or your loved ones suffer serious injury or death. Wear your seatbelt – Research has found that the proper use of a seatbelt reduces the risk of fatal injury to front seat passenger car occupants by as much as 45 percent and the risk of moderate-to-severe injury by up to 50 percent. Observational data from NOPUS has put seatbelt use for all U.S. passenger vehicles at around 86 percent. Buckle up. Use car safety seats for children – According to the NHTSA, proper use of child safety seats reduce the risk of fatal injury by 71 percent for infants and by 54 percent for toddlers in passenger car accidents. Obey the speed limit – The NHTSA reports that 30 percent of fatal accidents are speed related – that amounts to over 10,000 deaths in 2012. Keep up with safety recalls for your vehicle – 2014 was the “year of the auto recall” with automakers issuing more than 550 recalls for more than 52 million vehicles. Some of the recalls are for minor issues, but many were issued to fix very real safety issues. For example, Ford issued a recall for 2 parts in the ignition of several models that could cause the car to shut off and loose steering and prevent the airbag from deploying. You can search for recalls by vehicle make and model or by entering your car’s VIN into the database at safercar.gov. Don’t drink and drive – Alcohol was a factor in over 10,000 motor vehicle fatalities in 2012. Watch out for pedestrians – In 2012, 4,743 pedestrians were killed by cars in the United States and the vast majority were not at intersections. For more information about this topic, visit our pedestrian accidents page. Our dedicated attorneys have won over $1 billion in verdicts and settlements for their clients. You can view many examples of the cases on their case results page here. The Los Angeles car accident attorneys at Panish Shea & Boyle are no strangers to handling car accident cases involving serious injury or death. We have repeatedly fought for our client’s rights and secured millions of dollars in car accident verdicts and settlements. Among our wins include a $36.5 million verdict for a woman seriously injured when a truck hit the car in which she was a passenger; a $10 million settlement for the family of a teenager who was killed when a truck rear-ended his family’s vehicle; and a $9 million settlement for another teenager who lost both legs when her vehicle struck a broken highway guardrail. We have handled claims accidents rideshare companies, like Uber as well. We are uniquely equipped to handle all types of motor vehicle accident and crash cases, including collisions with commercial trucks or “big rigs”, automotive product defects; pedestrian accidents; and accidents caused by poor roadway planning or maintenance. If you have been injured in a car accident or even if you simple have questions about highway and road safety (here are some tips from the CHP), our firm can help. If you or a loved one has been involved in an accident please call our office in Los Angeles today at 877.800.1700. We offer a free and confidential case evaluation with our experienced car accident attorneys and serve clients in Orange County, Los Angeles, San Bernardino, and across Southern California.